For over 150 years, Cedar Crest has taken a bold approach to education by creating a college and a curriculum designed for women who want to achieve at the highest levels. Recognizing the multi-dimensional nature of students, Cedar Crest College is dedicated to the education of the next generation of leaders by preparing the whole student for life in the global community. 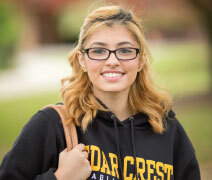 Cedar Crest also provides a wealth of opportunity for non-traditional and graduate students. Our coeducational School of Adult and Graduate Education (SAGE) demonstrates our commitment to education at all levels. SAGE offers valuable benefits for adult learners, including rewarding relationships with faculty, generous transfer credit policies, flexible degree completion maps, and much more. 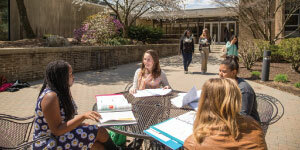 EXperience: At Cedar Crest College, education is more than lectures, textbooks, and exams. In every major, students learn through experience. From internships to service projects, Cedar Crest students graduate with skills that employers find valuable and that allow them to immediately contribute to their career fields and communities in a positive way. EXpedition: Cedar Crest makes it a priority to provide each and every student with a high-impact global experience. In the spring of 2018, Cedar Crest College officially launched the Carmen Twillie Ambar Sophomore Expedition, which takes the entire sophomore class to a destination for service and learning with the cost of transportation and lodging covered by the College. EXemplify: We provide resources that help our students develop the necessary skills to exemplify a balanced and healthy lifestyle. No matter what major students choose, they can always incorporate their passions into their experience. Whether athletics, dance, theatre, or even a second major, we offer a customized academic experience. Not only do we provide students with an outstanding education grounded in the liberal arts, we ensure that students graduate in four years through our Four-Year Guarantee program. EXposure: They say, “It’s all about who you know.” But at Cedar Crest College, it’s more than that. Our highly credentialed faculty members develop close-knit relationships with their students as they help build a solid platform for a successful career. Students also create relationships with professionals in their field through work with faculty members, providing exposure to opportunities that communicate the value of a Cedar Crest education. EXcel: Leaders innovate, inspire, and, most of all, take action! Our students do just that. With growth opportunities around every corner, Cedar Crest students develop critical-thinking skills, communication abilities, and confidence. Whether it’s organizing a fundraiser, starting their own club, or driving their own research projects, our students develop the skills necessary to excel upon entering the workforce.